Rome Metro B station at Termini. Photo by Bernard Chatreau, July 2009. Rome has a small but expanding subway that is easily overlooked by visiting railfans due to its size and the attractiveness of the trams that operate throughout the city (most other tourists also tend to never ride the Metro since it doesn’t have stops near most of the main attractions and it is easier to just walk from place to place). However, the system is interesting to ride and worth checking out. Presently, the system has two lines, designated as Line A and Line B. The lines form an X shape on the map, with Line A running from northwest to southeast and Line B running from northeast to southwest. The lines cross each other at Stazione Termini, which is the lone transfer point between the two lines. Line A is designated as such because it was the longer of the two at the time the lines received their designations, but Line B was the first to open (and is now slightly longer than Line A). Service on Line B ran from Termini to Laurentina in southern Rome starting on February 9, 1955 to provide service to the World Exhibition being held in EUR. The line was extended from Termini to Rebibbia on December 8, 1990. Additionally, two infill stations have been added and one station was moved to a new location over the years. Today, Line B is 20 kilometers long with 6 kilometers of surface or elevated running and 22 stations. Line A opened on February 19, 1980, operating from Ottaviano (near the Vatican) to Cinecittà. On June 11 of that same year, the line was extended by one more stop to the southeast, reaching its present terminal at Anagnina. Two extensions have occurred on the other end of the line. On May 29, 1999, Line A was extended from Ottaviano to Valle Aurelia. The last extension of this line occurred on January 1, 2000, when the line was extended to the northwest again, now reaching Battistini. Line A is 19 kilometers long with 27 stations. Line A is entirely underground, except for when it crosses the Tiber River between the Flamino and Lepanto stations. The route of Line A had to be modified several times over the course of construction due to the discovery of archeological artifacts during its construction. Both lines have left handed operation (like the London Underground) and use overhead catenary as their power source (like the Madrid Metro). Line A uses MA300 Stock, which was manufactured by CAF. These trains are 6 car trainsets with articulated joints between each car, allowing unobstructed movement from car to car. The MA300s also have automated announcements, LED displays that show the next station name and which side the doors will open on, TV monitors that show other information, air conditioning, and CCTV that enables the train operator to monitor what is going on aboard the train. Line B uses Breda MB100 stock, which is the original stock for the line. However, it appears that the cars are about to rebuilt, and as of May 2008, there was at least one train of MB100 cars that had been refitted with electronic exterior destination signs and enabled passage between train cars. Neither the MA300 Stock nor the MB100 stock has railfan windows. There are several new lines and extensions that are under construction or in the planning stages at this time. Line B1 is a 4.5 kilometer spur of Line B that is planned to open in 2010, running from Bologna to Jonio with 3 intermediate stations. Line C is an entirely new line that will operate on the tracks of the existing Rome-Pantano suburban line, which will be closed when Line C is complete. Line C will operate along the Rome-Pantano suburban line from Pantano to Alessandrino. It will then head slightly northwest towards the Pigneto neighborhood, where an interchange station with Line FM1 will be built. From there, Line C will head west to Piazza Lodi, San Giovanni where a transfer to Line A will be available, Colosseo where a transfer to Line B will be available, Piazza Venezia, San Pietro, Piazza Risorgimiento, Ottaviano (where another transfer to Line A will be available), before reaching the terminal at Clodio Mazzini. Unlike lines A and B, Line C is being built deep underground, where it is assumed that there will be fewer archeological discoveries that will delay construction or require reroutes, and a planned station at Largo Argentina was eliminated from the plan due to concerns about the archeological findings that would likely occur at that proposed station. The first segment of Line C to open is expected to be the Pantano to Parco di Centocelle section in 2011. This will be followed by an extension to Piazza Lodi in 2012, and to Clodio Mazzini in 2015. However, these estimates should be taken lightly, as public works projects in Rome (and Italy in general) are rarely completed on time. Other planned extensions include extending both Line A and Line B from their existing ends to the northwest and southeast in the case of Line A, and to the northeast and south in the case of Line B. Line C could be extended further north to Grottarossa, this could be open by 2017 if the rest of the line is finished by then. Finally, a Line D is in the planning stages. This line would run from Piazzale Agricoltura in EUR, through Trastevere to Piazza Venezia. It would then head along Via del Corso to Piazza San Silvestro and Piazza di Spagna before continuing out to the northeast, terminating at Ojetti with a transfer to Line B1 available at Jonio. This map image (Rome Metro Routes) is a file from Wikimedia Commons. It was created by Friedrichstrasse. Licensing type: Creative Commons Attribution-Share Alike 3.0. 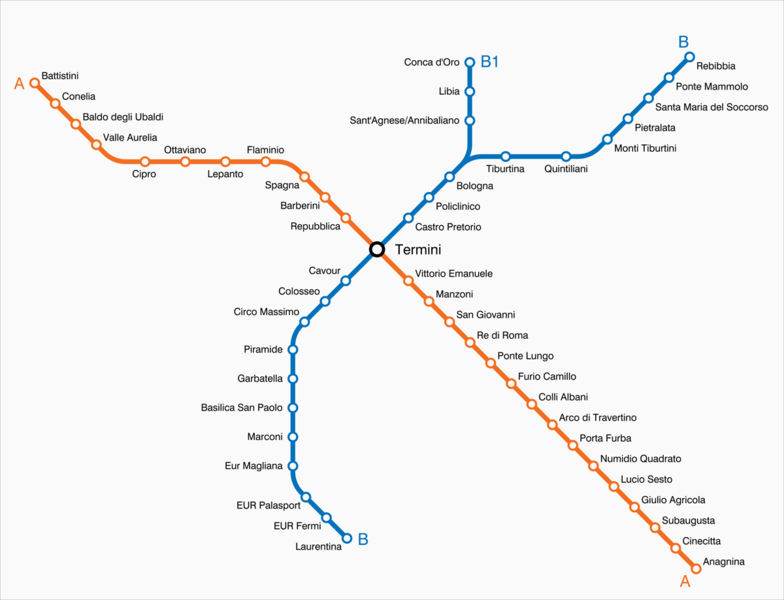 Original source: http://en.wikipedia.org/wiki/File:Mappa_metro_Roma_2012.png.